Directory All Packaging Machinery Corp.
All Packaging Machinery Corp., (*A*P*M*) has been serving the packaging industry for more than 70 years. We are dedicated to providing the most suitable model pouch and bag sealing machinery for each unique packaging application. Along with custom manufactured machinery for bag sealing and bag loading, All Packaging Machinery Corp. manufactures a wide range of bag sealing machinery for both the start up company and the well established production facility. All machines are manufactured in our plant in Ronkonkoma, NY (Long Island) USA. Our machinery is configured specifically for your unique product. Every component is designed to run smoothly and require a minimum of maintenance. We work hand in hand with engineers, machine designers, and packaging managers to ensure that the machinery required is the machinery we deliver. After our customer discusses their application with our engineering staff, samples of the pouches and product are requested for evaluation at the All Packaging Machinery manufacturing plant. All Packaging Machinery thoroughly tests each application and produces sample seals using the end user's pouches filled with their product. The sample seals are then returned to the end user so that they may do their own seal integrity testing and provide approval. Complete, visible validation for medical pouches. 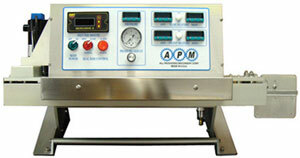 Supplied with verification ports for process validation of pressure, speed, and temperature. Embossing coder available. 3/8" wide hermetic seal. Pressure wheels can be added for more difficult to seal film and to provide flat seals. 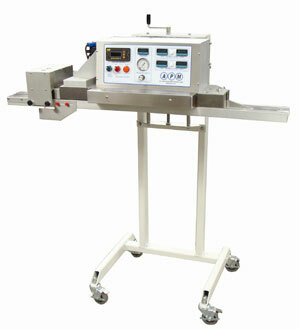 Dual heating and dual cooling bars offer faster sealing of difficult materials. Self-contained compressed air. 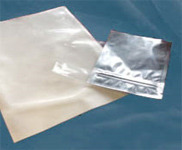 Seals Tyvek® pouches at speeds of up to 40 packages per minute. Mounted on heavy duty adjustable stand with crank handle height adjustment of sealing head and independent crank handle height adjustment for lower support conveyor for ergonomic flexibility. 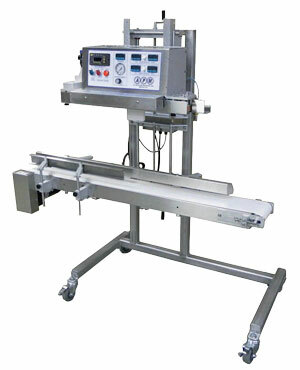 Sealer and conveyor are synchronized using closed loop speed controls. Validation model for lightweight products and smaller pouches. Designed on a swivel base for sealing from vertical to 45 degrees position. For questions regarding all models and add-on options with pricing information you may send an email to [email protected] or call 800-637-8808 to speak with Lynn Miranda in our Sales Department. APM maintains a complete in-house Engineering Staff and an in-house Service Department to advise mechanics regarding maintenance or repairs of machinery. Replacement parts are usually in stock and can be shipped within the same day for overnight delivery. 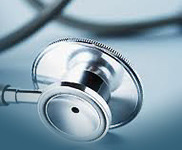 We offer technical support and troubleshooting over the phone and via email. 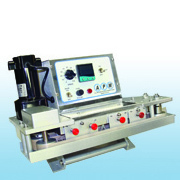 Operating manuals are supplied with each machine. When necessary, video clips are provided regarding the operating functions of the machinery to assist the operator for best productivity. We welcome your calls and emails with requests for help with your applications. Visit us also at East Pack Booth 2245, June 11-13, 2019 at the Jacob K. Javits Convention Center in New York. Bring your actual products and pouches or bags for a live demonstration! For more information contact All Packaging Machinery Corp.